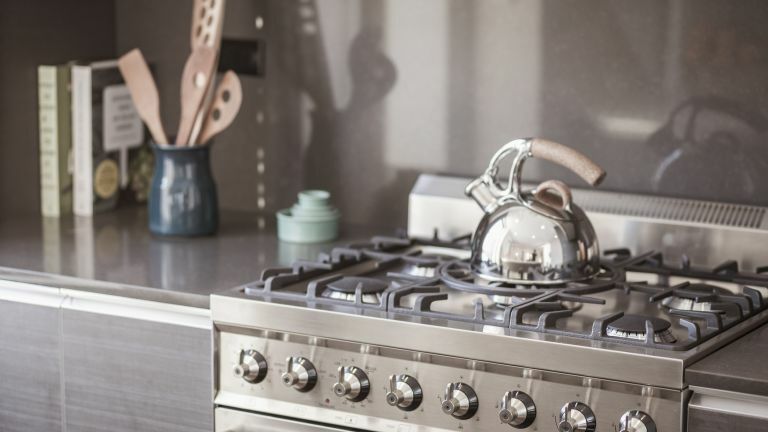 To begin cleaning a stainless steel hob, remove the pan support grates, burners and rings and leave them to soak in a sink full of hot, soapy water. Spray the hob with a multi-surface cleaner or wipe a cream cleaner on with a clean cloth. Leave for at least two minutes to loosen any burnt food or other grime. Remove the cleaning solution using a microfibre or other non-abrasive cloth. It doesn’t have to be microfibre, but should definitely be soft – nothing that will scratch the hob. Use a toothbrush to clean any hard-to-reach places your cloth can’t reach and to remove any stubborn food debris. Buff dry with a clean polishing cloth. Clean any remaining dirt from the burners, rings and grate which are soaking in the sink using a scourer. Dry thoroughly before replacing them. For an added high shine you can wipe a very small amount of baby or coconut oil over the top of your hob with a kitchen paper towel. This final step will make it sparkle. To clean a stainless steel sink, first rinse it with clean, warm water from the tap. Sprinkle bicarbonate of soda over the entire sink including the taps. This is a great stainless steel cleaner as it’s abrasive enough to scrub away stuck on grease, food and lime scale, but not so abrasive it will scratch the shiny steel. Allow the solution to sit for a few minutes while it does its work. Make sure you don’t scratch the stainless steel sink by using a damp, soft cloth instead of a scourer. Wipe the cloth around the sink. Get into the corners and around the taps, using an old toothbrush if necessary. Spray undiluted white vinegar over the bicarbonate of soda residue left in the sink. The vinegar and soda will fizz when they come into contact with each other. Vinegar is a good disinfectant and great for removing water spots. Once the sink’s looking clean, rinse using warm water from the tap and buff dry with a soft, clean rag. If your sink isn’t shiny enough you can polish it by buffing oil into it using a dry cloth. Top tip: Sparkling water can be used to renew the shine in your sink. Simply pour sparkling water into the basin and rub around with a clean cloth. Find more tips on how to clean a sink. To properly clean stainless steel pans, fill the bottom of the dirty pan with a layer of warm water and add 200ml of vinegar. Bring the pan of water to the boil. You may notice it already getting cleaner by the second. Remove the pan from the heat and add two tablespoons of bicarbonate of soda. It will start to fizz as the solution tackles the burnt-on food. You can pour out most of the vinegar first if you don’t want too much fizzing. Leave the mixture to work its magic for two minutes. Empty the pan and gently scrub with a sponge scourer as normal – do not use steel wool pads or copper-based scrubbers as they will scratch your pan. If there are any super stubborn marks that don't come off with the scourer add an extra bit of bicarbonate of soda and leave for 10 minutes before scrubbing again. Top tip: To clean burn marks from your pans when they’ve been left on the stove for too long, use a mildly-abrasive cleaner, such as Bar Keeper's Friend. Sprinkle onto the bottom of your pan, add a little water to form a paste and scrub with a wet sponge. Rinse thoroughly. Clean your stainless steel cutlery in warm, soapy water – your usual washing up liquid is perfect. Hand-dry with a clean non-abrasive cloth to remove any water spots. The quicker you dry it the better it will look. To remove stains and polish you can use any of the following natural cleaning solutions – vinegar, cider, lemon juice, olive oil and soda water. To polish with vinegar or cider, buff your cutlery in a circular motion with a soft damp cloth lightly dampened with cider or undiluted white vinegar. To polish with soda water, rinse the cutlery in the liquid and dry immediately with a dry non-abrasive cloth. To polish with lemon juice or olive oil, apply directly with a soft dry cloth, gently rubbing away at the stain. Then buff dry with a different cloth.